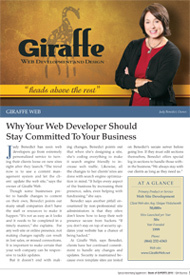 Judy formed Giraffe Web Development and Design in 1999. Prior to forming her own company, as V.P. of Operations for Goddard Technology, she completed several database, hardware, software and training-related projects for hundreds of companies such as Intel, the United Nations, AT&T, Hallmark, Buckley Air Force Base, Atlanta-Hartsfield and Dulles and National Airports, First National Bank of Chicago, and Greenville Hospital System. After graduating from college, Judy worked in the field of real estate finance for 10 years before making a career move into the field of high technology. Judy is a graduate of Leadership Greenville and Furman Women’s Leadership Connections and is a judge for the Greenville Tech Charter High School senior projects. Currently she serves on the Greenville County College Fair steering committee. She is a past board member of ECPI College of Technology & ITT Advisory Board, the Greenville County Historic Preservation Commission, the United Methodist Women of Buncombe Street UMC, the Kappa Delta Alumnae Association of Greenville, Stone Lake Community Club, A Child's Haven, Lapsits for Early Literacy and is the founder and editor of The Hampton-Pinckney Gazette. In addition to her nonprofit involvement she is a certified aerobics instructor through the American Council on Exercise, CrossFit Level 1 Certified and is a world-champion powerlifter through the World Natural Powerlifting Federation. 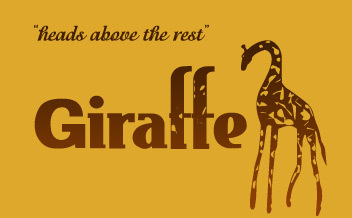 Shay has been affiliated with Giraffe Web for the past seven years. Her background includes html coding, business consulting, and social media. Her previous experience as a Loan Officer for the NC State Employees’ Credit Union, City Executive for Wachovia Bank, and Database Marketing and Marketing Research across multiple industries gives her extensive insight to the social media/blogging outlets with which she is currently involved.